Woodyland In Bad Decline: 'Wonder Wheel' Woody Allen's film about an unhappily married woman in 1950s Coney Island strains to evoke Eugene O'Neill. Critic Andrew Lapin says Wonder Wheel "isn't merely a bad movie but a laughable one." 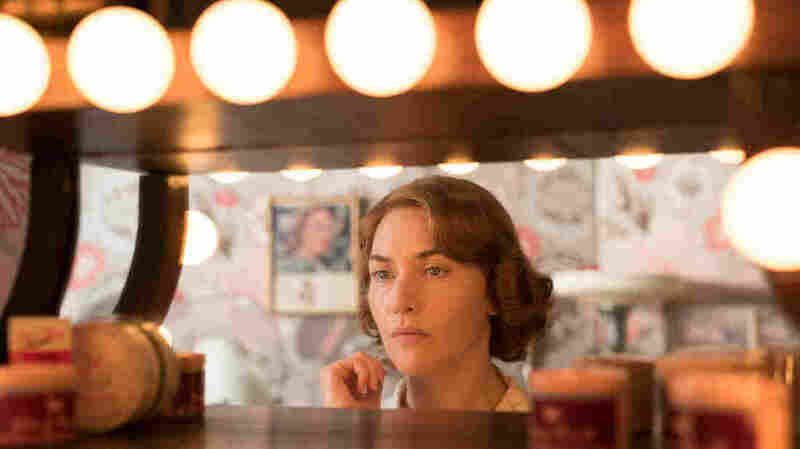 Kate Winslet as Ginny, a 1950s waitress on the verge of spinning out, in Wonder Wheel. Fate, in the Woody Allen sense, is when human error and circumstance join forces to make your life miserable. So maybe there's something fateful in the fact that Wonder Wheel, his first movie in a decade to get a holiday release, happens to be coming out during a winter of extreme discontent in entertainment, thanks to revelations of men who have for decades abused their positions of power to harass and harm women. One of the key reporters behind those revelations? Allen's estranged son, Ronan Farrow; the reasons for their estrangement are well-documented and hardly worth re-litigating here. Suffice it to say that a line in this movie about a father treating his daughter like his girlfriend won't go unnoticed. The Harvey Weinstein effect has already added a new layer of scrutiny to Allen's films. Author Claire Dederer articulated this in her recent, very good piece in the Paris Review, one of the literary publications whose fawning coverage of Allen helped solidify his artistic bonafides. Dederer pitted her disgust with Allen's behavior against her long-held affection for his films: "I'm not ahistorical or immune to biography," she writes. "That's for the winners of history (men) (so far)." And Allen must be a winner of history, because his latter-day films are almost all ahistorical. Even when they are purportedly about a real moment in time, as is the case with Wonder Wheel and his previous film Café Society, they aren't focused on the period so much as a wispy idea of what that time represented to Woody Allen. This movie doesn't even bother to define the year in which its Coney Island-set melodrama takes place, beyond noting it's the "1950s." But the real 1950s were too messy for an Allen film to deal with truthfully, anyway, so it's better for him that we already understand his movies take place in Woodyland, a funhouse version of reality not unlike Coney Island itself. And like the real Coney Island, the paint in Woodyland is chipping and the luster is vanishing. Wonder Wheel isn't merely a bad movie but a laughable one. Allen's scripts were never realistic, but here every character is a self-parody with a straight face, saying ridiculous things like "I know where the bodies are buried," "I went to the school of hard knocks" and "The dramatist in me sensed she must be in some kind of trouble". When they aren't marble-mouthing their way through this stuff, they're working themselves into a fever gushing about Eugene O'Neill, as though Allen hopes that invoking the spirit of one of history's greatest dramatists will elevate the film in the same way that summoning the ghost of Tennessee Williams did for Blue Jasmine. It doesn't. The film's would-be saving grace is Kate Winslet, who hyperventilates trying to pretend she is embodying a real character being pulverized by fate, instead of a Woodyland creation devoid of agency who's being pulverized by a weak script. Winslet plays Ginny, an unhappily married 40-year-old waitress who lives inside fantasies of her youth in the theater, shades of The Purple Rose of Cairo. Her permanently oil-stained second husband Humpty (Jim Belushi in full fuhgeddaboudit mode) repairs the boardwalk's merry-go-round and is shocked anew every time she tells him she doesn't want to go fishing or see a baseball game. Her son from a previous marriage (Jack Gore) is a pyromaniac, because it lets the film cut away to him starting a fire as a convenient metaphor. In the opening scene, Humpty's beady-eyed, estranged daughter Carolina (Juno Temple, in a series of cleavage-baring summer dresses) comes begging to stay in their rickety yet spacious boardwalk apartment: she's on the run from her mobster ex-husband and needs a place to lie low until things blow over. Soon, in Ginny's eyes, everything that goes wrong in her life will be Carolina's fault. We're basically sleepwalking through Woodyland by this point. But it all might have been a pleasant slumber were it not for this movie's requisite intellectual, a smarmy lifeguard named Mickey and played by Justin Timberlake in a mind-bogglingly awful performance/part mashup that's like O'Neill read by Tommy Wiseau. Sure, it may not entirely be Timberlake's fault that his Leave it to Baywatch beach bum is also an aspiring playwright who drones on about "the romantic narrative of the writer's life." But the multi-talented heartthrob has never looked more lost than when he's trying to slather conflicted feelings for two women in a thick coating of gee-whiz mid-century smiles. Mickey's having an affair with Ginny, who's pegged him as her ticket out of a miserable life, until he throws everything into chaos by falling for the sweetly naive Carolina (the woman's non-biological daughter, hint hint). You see, Mickey is a lifeguard who endangers lives, and that's about the level of irony we're operating on. It's possible that Allen is using Mickey's frequent monologues to knowingly embrace drama-student clichés instead of falling back on them, but the film (which turns on a particularly rusty screw) isn't self-aware enough to make that distinction. Forty years ago, Joan Didion called Allen's characters "clever children... acting out a yearbook fantasy of adult life," and today that sense of unreality both saves and dooms his art. Saves, because it lets Wonder Wheel look gorgeous on its own merits, decorated with lush, red-purple-blue lensing (by cinematographer Vittorio Storaro) and lovingly detailed boardwalk production design (by Santo Loquasto and Regina Graves). Yet dooms, because all that pretty stuff sits there indifferent to us, to its creator's behavior, to the world: a piece of anti-wonder. His next movie will be out next year, and then we can do this all over again.